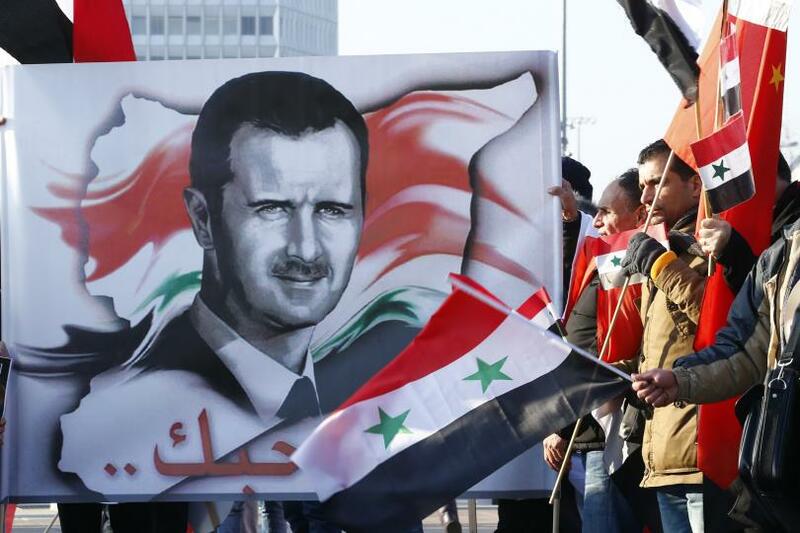 Supporters of President Bashar al-Assad carry Syrian flags and portraits in front of the United Nations European headquarters. Geneva, 31 January 2014 [Reuters]. Thanks to military and police control inherited from the French colonialism, Bashar al-Assad’s rule went almost completely unchallenged, writes Stratfor, the global intelligence company. A full five years have elapsed since the onset of Syria’s civil war. Amid perpetually delayed peace negotiations, cease-fires rife with loopholes and increasing proxy support from around the world, what is now a truly global crisis looks as though it will last well beyond its fifth anniversary. How did it come to this? Prior to the outbreak of violence in 2011, the prevailing wisdom was that Syrian President Bashar al Assad’s administration was immune to revolution. That spring, I was preparing to head to Damascus as anti-government protests escalated in Tunisia, Egypt and Bahrain. But a Lebanese friend expressed the widely held view on Syria: Such uprisings could never happen there. The government would never fall. On March 15, 2011, protesters poured into the streets of Damascus, outraged at the government in part for torturing several students who had scrawled pro-revolutionary graffiti in Daraa. Demonstrations turned into violence. Violence became all-out civil war. Yet with remarkable tenacity, the president has held on to territory through five years of bloody conflict, prolonging his family’s control of the country even when confronted with opposition from the international community. Now he enjoys support from the likes of Russia, Iran and Hezbollah. But al Assad’s administration has proved resilient for reasons beyond its foreign patrons; massive intelligence and security capabilities have helped the minority-led government maintain control over a diverse population. The assortment of religious and ethnic groups within Syria’s borders has historically posed challenges for its rulers. Modern Syria’s diverse heritage was better preserved under Ottoman rule than under the later French mandate, which set an unfortunate precedent in favoring some groups over others. When the last French soldiers left Syrian territory in 1946, the newly independent Republic of Syria worked to bolster its military and intelligence capabilities. Syria formed a short-lived union with Egypt in 1958, extending its transnational reach. Throughout this period, the Arab Socialist Baath Party asserted more control, gradually gathering government power and leading coups in 1963 and 1966. Perhaps the most critical component in keeping the government’s rigid grip on power was Syria’s powerful intelligence agency, the mukhabarat, a vestige of French colonial heritage. Known as the Deuxieme Bureau until 1969, Syria’s intelligence sector was heavily modeled on the one created under French rule. It aggressively punished opposition groups in Lebanon, fostered support among sympathetic religious and ethnic groups outside Syria’s borders, and funded organizations such as Hezbollah. Under the first al Assad, the intelligence service became even more powerful. Extensive transnational mukhabarat networks enabled the government to monitor a diverse population spread over a large territory and punish dissent. Anyone who spoke ill of the government or even made jokes about the president risked censure. Meanwhile, Syrian intelligence organizations became political entities in their own right, taking control of domestic and foreign policy. Thanks to military and police control, al Assad’s rule went almost completely unchallenged. When threats did arise, the military crushed them almost immediately. In 1982 the Muslim Brotherhood organized in Hama against the Alawite-led government. In response, the Syrian army killed tens of thousands of Syrians to wipe out the rebellion, an act that cemented public perception of the president as a brutal leader. Not everyone suffered under the police state. Syrians who took care to obey the law and avoid anti-government sentiment could evade the brutality. And the harsh punishments doled out by the security services deterred everyday crimes as much as they did political dissent: The country had low crime levels throughout al Assad’s time in office. Still, many Syrians struggled to achieve a decent standard of living. Bashar al Assad took over the presidency from his father in 2000. Trained as an eye doctor and with little political experience, he was never meant to inherit the position. But his older brother died in a car accident in 2000, leaving the position open for the younger al Assad. The new president inherited the police state and patronage networks his father created. Since the outbreak of war in 2011, that system has served him well. Today the Syrian leader retains the grudging support of the Alawites, favored by al Assad’s administration, along with various religious sects that consider Syria more dangerous without al Assad than with him. The leader’s close ties with the country’s business and military leaders have provided enough support to help him hold and defend his coastal and southern territory. When he first took office, al Assad made scant liberalizing reforms to the police state he inherited. To a small degree, he embraced the need for tanafus — the release of opinions to keep discontent from boiling over. During this Damascus Spring, as the brief period after al Assad’s rise to the presidency was called, the government tolerated more freedom of expression. Though blatant anti-government messages were still grounds for brutal punishment, a tentative nationwide political debate was allowed to begin. Syria’s anxious elite soon reversed most of these reforms. The administration’s harsh response to Arab Spring protesters confirmed that any visions of a more open Syrian civil society were a far cry from reality. But that brief period of greater freedom remained ingrained in the psyche of many Syrians.